Hi guys and gals! Currently my only approved costume is my Chewie. Even though Chewie is a rockstar at a lot of events, there is a darkside to it. It usually takes at least one to two people to dress me. I need a dedicated handler to make sure I don't crush children or fall over things in my stilts. Also Ive had a knee surgery recently and the stilts are a killer on my knee and hips. Anyhow, enough complaining about costuming, we all make sacrifices to troop. So it wasn't until I visited my Rebel Legion friends in Tokyo that I realized that I think I would make a decent Jek Porkins. Being a 6 foot 330 pound bearded man, what better costume? Long story short is I wanted to know the veteran pilots recommendations. What was a sticking point on your build? What is hard? What would you do different if you had to do it all over again? As far as the build I would of course like it Legion approved, however I'm not looking to be 100% 1977 authentic. For instance I don't need metal code cylinders and flares. I don't need a working mic and com pad. However visually I would like it too look as accurate as possible. What fan made gear do you recommend (chest boxes, helmets)? Which fan based builders did you use? I'm experienced with armor building so putting together the kit helmet should be within my skill. I'm also experienced with prop building, molding and painting. I'm still new to the sewing game but I do want to take on the challenge of modifying work overalls to a flight suit (pockets, collar, etc). Also on "water decals" do you use them or just custom paint your helmet? Do decals exist for Jek Porkins? Is there a template for his markings? A big thanks in advance for any advice you guys can give to a possible pilot. It's a long time before Celebration 2015, but like I said I have a lot of Chewbacca upgrades to knock out first, but I'm hoping to have both costumes completed before the Celebration. 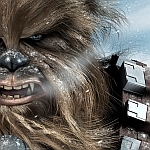 Checkout my Chewbacca Facebook page for pictures and videos. I forgot to add like any good RL member, I did my research. I still want to know what the x-wing pilots here ended up doing or what they would have done different. This is the list I came up with so far (working from head to feet). As always I'm open to suggestions. Fan made helmet. Taking suggestions. Question: I noticed almost all kits come with a styrene strip for the top of the mohawk which is appied on top. I also noticed that in almost all applications there is always a noticable gap between the strip and the helmet. Is it against standards to use dody filler and sand it down smooth? I noticed in some scenes the gap is notiable in others it seems smooth. I'd hate to have to hand paint, but I do have the equipment and somewhat of the skills to do it, but I'd prefer decals. I really like JediXXL's Flak Vest Tutorial, but like I said, I'm new to sewing ad that thing looks like a challenge (way worse than the flight suit). I'll go fan made, but I'm worried about them being "porkin sized". Recommendations welcome. I would like to build my own. I will most likely build off of this thread here: Dimensions for chest box? Question: Is there a deffinative hose? Diameter? Type? I noticed some hoses are spiral in ribbing. Others have horazontal ribbing. I might just get the Elvis Trooper versions and save a bunch of time (asuming he still makes them). If not this tutorial by Datalore looks easy enough. Digging these leather gauntlets by Leather Mystics. If it's a big deal I can always get the Engineer Leather Motorcycle Boots from Cycle Gear. I have a Cycle Gear localy so if they don't fit I can return/exchange. Again thanks in advance for any help you can provide! • Take it from a Pilot LCJ, the Flak Vest is the #1 item that throws a pilot costume submission into a tailspin. Otherwise, reeeeaaallly read the Costume Standards and make sure you follow them. • Yes, you can bondo the gap between the mohawk strip and the helmet. • Most people paint their helmet designs, some use decals. It's all personal preference. • There should be no logos/decorations or buckles on the boots. • Take it from a Pilot LCJ, the Flak Vest is the #1 item that throws a pilot costume submission into a tailspin. Otherwise, reeeeaaallly read the Costume Standards and make sure you follow them. The Rando Mextra (Formerly known as Jedi Mickey) helmets are smaller than other vendor helmets. Maybe too small if you have a large head! Mistakes tend to creep in to the Costume Standards and it's not always 100 percent correct. Unfortunately when there is a mistake posted on the Standard, it can stay there for a very long time. If something doesn't seem quite right, double check it on the forum. The upper buckle on the Engineer Motorcycle boots is an important "Functional" piece that holds the top of the boot shaft together, and most people do not remove that one. You can simply let your pant leg on the jumpsuit drape over it a little to cover it. If an LCJ says that my suggestion is incorrect, and there is some other recommendation to modify the boots, then Please post it because I haven't seen any. The lower buckle on the motorcycle boots is purely decorative and needs to be removed. I do not usually go by those chest box graphics that are posted. Many of them have been modified by other people then reposted, and they are not very accurate! This one definitely looks to be a modified one as nothing on it really resembles the screen used chest box. I have never, ever seen a white rocker switch with a dark colored top edge!!!! Also look at the position of the target dot (at the top) in relation to the square buttons. That graphic shows it no where hear it's position on Porkin's box in the movie screen grabs. You can barely see the top edge of the outside rocker switch in the screen grab, and it looks dark colored, not white. The action figure actually has the switch colors as grey-white-grey. This is why I chose to go with those colors for Porkins chest box. As far as the type of hose attached to the chest box. For most people it's a matter of whatever hose they can find that looks fairly accurate. The correct size is about 1 1/8" diameter but most chest box makers use a hose that is 1" diameter as it's the only thing available that comes bulk in large rolls. There are a couple of different washing machine drain hoses that can be found that are about 1 1/8". One has more pronounced ribs like ESB boxes, and the other has more of a flat surface on it like the hoses you see in ANH.